I have to admit it. Yesterday was not a great day. My little Bekah is sick and the weather reminded me of those blustery days in the Winnie the Pooh books. The wind was blowing and the sky was gloomy. The clouds kept rolling and it was just cool enough to need a light jacket. It reminded me of the days we spent with our little one feeling sick last December. 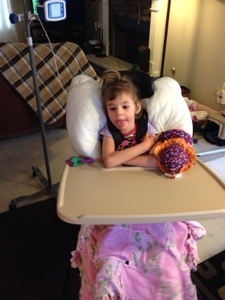 We were cooped up in the house for weeks and Rebekah was struggling. It was hard to watch. I just wanted to take the infections from her little body and make it all better. I clearly remember those weeks flowing with conversations between me and God containing questions, tears, prayers, bargains, more prayers, comments of disbelief, soul aching, more tears, and more prayers. Yesterday we spent the afternoon together on the couch in a snuggle. This was so good for my mama heart. 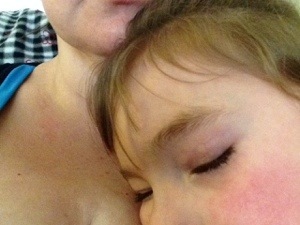 My little sleeping one resting on my chest makes my pulse slow and my my mind pause. When I feel her body relax, mine follows suit. What a gift a snuggle can be! Instead of questions and tears, my conversation yesterday was one of praise to God for His hand on our family and His reassurance in my heart. This entry was posted in Parenting Adventures, Rebekah's Updates. Bookmark the permalink.